The SmartDrive Collision Snapshot for transit illuminates key observations that distinguish collision operators (those involved in at least one collision during the 12-month analysis period) from non-collision operators. The contractor currently operates 268 vehicles for TriMet’s LIFT paratransit services and manages all scheduling and operations of the paratransit call center. The new capability uses sophisticated accelerometer-based technology and integrates with rail vehicle safety systems to detect high-risk maneuvers that fall outside normal operating parameters. 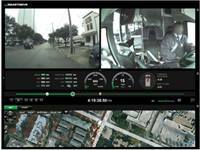 Following the extensive trial of the video safety solution, during which LA Metro noted improvements in rail safety, the agency issued a comprehensive RFP for its bus and rail lines. The BIG Innovation Awards recognize organizations and people that bring new ideas to life and the program’s selection of Assurance 360 reaffirms SmartDrive’s commitment continually seeking ways to deliver actionable insights across safety, operations and maintenance that materially improve fleet efficiency. Agencies striving to meet service demands and overcome budgetary pressures are continuing to make safety of operators and riders a priority, however, it’s not always something that can be given a huge investment. What we’ve seen, though, is that investing in safety can actually work to the benefit of agencies in terms of efficiency increases and cost reductions.